The history of the club can be traced back to before the First World War in 1914, with a club based at the Molineux with a track around the football pitch. In 1924 Wolverhampton Athletics Club was formed and in 1943 they merged with Penn Harriers to form Wolverhampton Harriers. After using various grounds in Compton, at Tettenhall College and Marsh Lane the club moved to Aldersley in 1956. The municipal sports stadium was also home to Wolverhampton Wheelers Cycling Club. 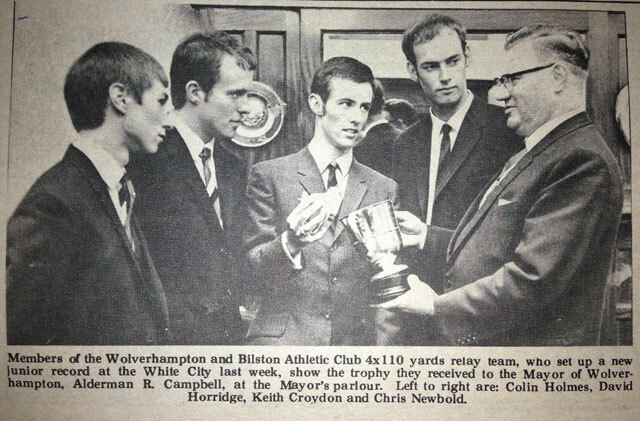 In 1967 Bilston was incorporated into Wolverhampton in a local government reorganisation at this time the two local clubs, Wolverhampton Harriers and Bilston Town Athletic Club merged together to form Wolverhampton and Bilston Club. A little like our football club the club was once the leading athletics club in Great Britain winning the National League Division One for men from 1975 to 1982, the Men’s National Cup final 1976, 1977, 1979 and 1980. It also represented Britain in the European Clubs Cup from 1976 to 1983 with the best finishing position of 3rd. The Club has had numerous Olympic, Commonwealth and European Medallists. Famous atletes who have represented the club include; Jim Auckett, Don Holliday, Verona Barnard, Maureen Tranter, Rosemary Stirling, Mike Bull, Phil Lewis, Ralph Banthorpe, Sonia Lannaman, Kathy Cook, Gary Cook and Tessa Sanderson. In 1960 Peter Radford broke the world 200m record in 20.5 in an international held at Aldersley. The club suffered some decline in the 1980’s one of the main reasons for this is that it is not possible to have 8 lanes around the track due to the cycle track, this has prevented the club from getting some of the larger meetings. However in recent years the club has had a resurgence…..